Morrighan's war to destroy every gnoll, kobold and baddie in the world continues, and Nexon needs the help of The Escapist warrior community to complete the goddess's vision. By participating and becoming part of our in-game guild, you will be eligible to win a limited edition Vindictus branded Spirit Hood! Vindictus is a free-to-play MMORPG like no other. Blood spurts from enemies as your twin blades slice through them. Enemy corpses themselves become sadistic weapons as you lift them up and use them against fresh enemies. Walls crumble and whole buildings topple, providing you with new toys in the battlefield. With Source Engine physics and destructible, interactive environments, Vindictus redefines everything you thought you knew about "free-to-play." 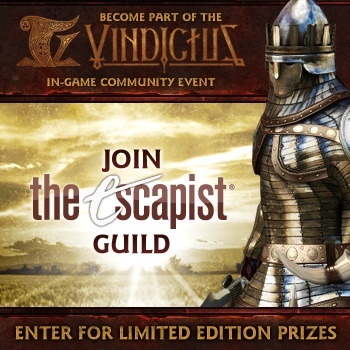 If that wasn't enough to make you want to download and play, members of The Escapist staff have created a guild and are giving away prizes! What are the prizes you ask? We have five (5) limited edition Vindictus Spirit Hoods to give away to those brave enough to help us become the largest guild on the server. To aid us on our path, join Kuliani(as Kuliania) and Spinwhiz (as Spinwhiz) in-game every day this week from 3PM to 5PM EST for grouping, questions and overall comradery. Nexon created a simple (and FREE) registration process, so click here to head over to the main event page and view all the rules. Please note, Vindictus will currently only work for those residing in the United States.